The Hot Dog Hols teams are always out and about, walking or caring for your pets. We keep our social media updated with our latest goings on so please head over to our group for bang up to date news on our Hot Dog adventures. The newly refreshed Hot Dog Hols Facebook page is still providing a light hearted look at the world of hot dog hols. 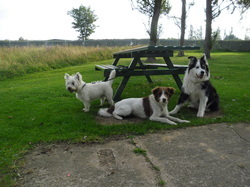 Our Group is still the place to go for all your photo updates for home boarding, pet sitting, dog walking and day care visitors. The page will contain more relaxed content, funny videos, memes, great photos and interesting topics. We'll also put product reviews, blog posts and breed profile links on the page throughout the year so make sure to LIKE the page AND join the group next time your using Social Media. The first two months of 2017 have been action packed in the Hot Dog Hols household and we've loved looking after your dogs! A few more regular dogs have joined our day time walks and we're getting a full schedule across the busy lunch time periods. The Hot Dog Store, launched last year and including a range of great dog treats, toys and pet products, is going from strength to strength and we have some store updates to do soon. The popular Duck and Chicken Fillet treats from Leaps and Bounds has generated a lot of interest, but unfortunately these products are no longer available through the store. We have some great alternatives to consider though so why not check out the Green and Wildes range. We'll be back soon with more updates but keep and eye on the facebook page and group for all the goings on with Hot Dog Hols.